This rare norrow-winged, Kestrel-sized falcon typically associated with Palm tree.It can easily be identified from its Red-rufous crown that extend all the way to the scapular. This beautiful raptor has a white face, chin and the upper breast, with broad pale rufoous band across upper breast.Pale blue-grey above with fine black barring;primaries and primary covert darker. The wings are pretty short compared to typical falcons like Peregrine. Uncommon in low open country, especially with palms and acacia of Galana river, Meru and Samburu national park, Lake Turkana and the coastal part of Kenya.This photo was taken by a friend of mine in Samburu National Reserve. 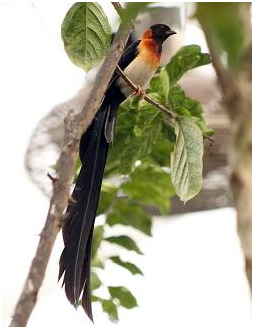 The Eastern Paradise Whydah is a small, widely occurring bird of eastern Africa. It gathers in flocks but separates into pairs during the mating season.Easten Paradise Whydah is a species specific brood parasite with its target being the Green-winged pytilia. This bird is both dichromatic and dimorphic during the breeding season. When in “breeding mode”, the male has black plumage along its back and tail, with a yellow nape and chestnut colored lower breast and belly. It also grows new long- tail feathers. During the non-breeding season, it loses its striking black and yellow coloration, becoming brownish in color with black streaks on its head. The female has grayish, black-streaked upper-parts with a brown-colored head. Its breast is pale gray and its belly is white. The Eastern Paradise Whydah feeds on grass seeds such as millet and wild oats, but will occasionally take termites and grubs. It inhabits dry thorn scrub and open or woodland savannahs throughout eastern Africa. Fairly common after heavy rains both as a resident and a wonderer , appearing usually near watering areas. Well distributed in the area of Samburu, Meru, Lokichokio, Turkana, Tsavo and Amboseli National park.